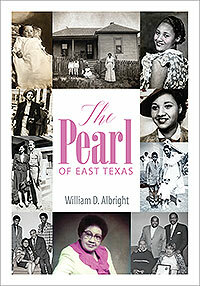 William D. Albright’s “The Pearl of East Texas.” Mattie Pearl Albright was born in Shreveport, Louisiana during the Jim Crow era in the early part of the 20th century and then moved to the East Texas city of Berryville. She was a “hero” in that she rose up to stand against the denial of her constitutional rights when bravery was needed. She had a positive impact on her environment and the circumstances in which she lived. This book tells of her remarkable and extraordinary story of love, charity, compassion and leadership.